The Eagle Scout rank is a life-long achievement that’s always carried a special significance. College, business, the military, and community service leaders all respect an Eagle Scout. This performance-based achievement has high standards that not everyone will earn. Only about 6 percent of all Boy Scouts earn Eagle, making about 2 million Eagle Scouts since 1912. 9.0.2.7). Get your Eagle Project and Eagle Fundraising Approved before starting either one. Attaining Eagle can be daunting but is also very rewarding! There are plenty of materials to guide Scouts on their journey. These resources are available through the Boy Scouts of America national website and here on our council’s website. The Scout must complete the Eagle Scout Service Project Workbook , the previous version may still be used for any Scout whom began their actual project prior to Jan 2019— Eagle Scout Service Project Workbook, No. 512-927. No other form is permitted. The Eagle Scout Service project is one of the most recognizable parts of earning the Eagle Rank. While a Life Scout, plan, develop, and give leadership to others in a service project helpful to any religious institution, any school, or your community. (The project must benefit an organization other than Boy Scouting.) A project proposal must be approved by the organization benefiting from the effort, your unit leader, the unit committee, and the district advancement team before you start. You must use the Eagle Scout Service Project Workbook No. 512-927, in meeting this requirement. All proposal approval signatures and project fundraising form approvals are done by your local district advancement team. An Eagle candidate must list six references on his Eagle Scout Rank Application. The only line you may leave blank is employer (if any). As a courtesy to the board of review members, confidential reference letters are requested by the Eagle candidate (or designee) on behalf of the Eagle candidate from these references. The confidential letters should be mailed directly to the designated District Eagle Board Chairperson. Please ask in your District for the correct name and address. These should not be sent to the Eagle Candidate or his Unit Leader. These letters are confidential and are not returned to the Scout or Unit following the board or Review. See Related Contents for a sample of the letters. Requirement #4: Complete six months of leadership while a Life Scout in an approved leadership position. 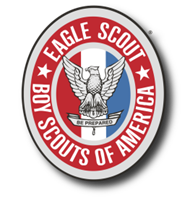 See the Boy Scout Handbook or Eagle Scout Rank Application for approved positions. If a Scout foresees that, due to no fault or choice of his own, he will be unable to complete the Eagle Scout rank requirements before age 18, he may apply for a limited time extension. Remember, school, sports, or work do not qualify as a reason for extension. Submitting completed paperwork to the council office after turning 18 does not need an extension.